To clarify, I'm not attending a proprietary culinary school but rather the local community college that offers a culinary arts program. Currently the school is recognized by the National Restaurant Association and is also in the process of becoming accredited with the American Culinary Federation. Most likely it will be accredited by the time I complete the program which will be by next summer or fall. The program I'm in is the Professional Chef track where I'll receive a Professional Chef certificate upon completion. Based on my previous culinary experience and personal goals, this program is what the faculty has advised me to take. For now, this suits me perfectly but perhaps later down the line, I may continue on. This semester I'm taking three courses - Food Service Sanitation, Nutrition, and Culinary Principles 1. Nutrition - This course introduces students to the principles of nutrition and the application of these principles to the food service industry. Topics include fundamentals of food chemistry and nutrition for different age groups and the special needs of individuals. This course meets the requirements for the nutrition course for American Culinary Federation (ACF) initial certification and/or re-certification. So far, this class has been very interesting and I love how my professor really encourages us to talk and share our thoughts on the various topics regarding nutrition. From various diets, food movements, the food processing industry, etc... it's a class that really fosters engaging discussion. For some, this class may be a bit dry however I love talking about food and how it affects people, cultures, etc. coupled with medical and science information intertwined. Homework: Lots of reading for my Nutrition class... three chapters to be exact. Along with reading, there are mini chapter quizzes to complete and reviewing a lot of key info and terms which will be on our first quiz in 2 weeks. Culinary Principles 1 - This course is one I'm really excited about. 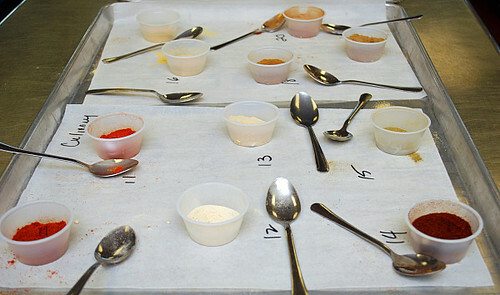 This lecture and lab course introduces students to the principles of commercial food preparation with emphasis on the development of a basic foundation of culinary skills. Topics covered include the history of culinary arts, development of modern food service, classic and modern kitchen brigades, kitchen sanitation and safety, recipes and menus, professional kitchen tools and equipment, knife safety, flavors and flavorings, dairy products, mise en place, cooking principles, stock and sauce preparation, and soup identification and preparation. Chef S is my instructor and there are about 16 people in my class, many of them are much younger than me. There are a handful of classmates that are career changers and are more around my age. What's nice about this class is how diverse we all are and our skill levels all vary. From students who don't know how to cook at all to those who already work in the industry... it's a nice group that I'm looking forward to working with more in the coming weeks. The only thing that came as a surprise is the time of our lab class changed. It was a mistake made by the school so everyone had to adjust their time to come in an hour and a half early than the original course schedule noted. In our lecture portion, we learned about the very beginnings of how a restaurant came about in history (which really wasn't that too long ago - late 17th century,) key people in the industry, historical milestones of culinary beginnings and overall professionalism in the kitchen. We also covered the highly important topic of food safety and sanitation. Lots of talk on preventing contamination, proper food storage, illnesses caused by improper handling of food and kitchen safety. I learned about Hazard Analysis Critical Control Points (HACCP), which is a system for managing and maintaining sanity conditions for various food service operations. Can you identify the following spices? 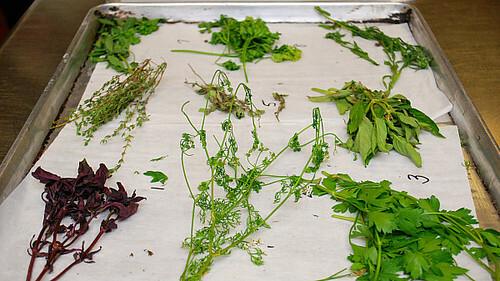 Can you identify the following herbs? In our kitchen lab portion (my favorite part! ), we did quite a few things. First off, due to the last minute time change, I couldn't get out of my prior commitment early enough... so I was 15 minutes late to the kitchen lab. The class started with identifying various herbs and spices, as well as doing some conversions (ounces to pounds, tablespoons to cups, quarts to gallons, etc.) We were all given a handout to complete with our guesses to the herb/spice identification exercise along with conversions we had to make. This handout wasn't towards our grade but rather a prize, where the student with the highest number correct wins. I completed the handout but felt a bit rushed because I needed to catch up with the rest of the class after coming in late. Normally, I review my work once, if not twice before turning it in. Yeah, I didn't do that this time... oh well. After the handouts were reviewed by Chef S., he announced there was a tie. I figured I rushed too quickly and there were a few items I knew I missed for sure... so it couldn't have been me. After we went through the handout and answers, I was shocked I was in the tie with someone! Wow! So Chef S. had to decide which person to give the one and only prize to. One of the herbs we had to identify was mint (which I put down)... however although it was mint, it technically was spearmint, the answer which my classmate had. So she won the coveted prize - a new Henckles knife to add to her kit. Gah! I guess the lesson learned is to be as specific as possible and to take the time to review my work once, if not twice before turning it in. We also practiced our knife skills by chopping up vegetables for the basic mirepoix - onion, carrots, celery and even some garlic. 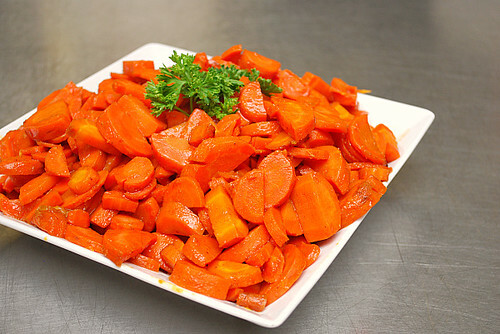 Chef S. took the carrots we prepped and made a simple carrot dish using a bit of cayenne, honey, brown sugar and water. It was delicious and so simple! Homework - I've got quite bit of work ahead of me to complete in this class for next week. One chapter to read, three chapters of discussion questions to answer, and a 2-page report on the hospitality industry. I'm also getting a head start on a 3-page report on a spice or herb of our choice, accompanied with a 5-10 minute presentation done in front of the class. That's due in 2 1/2 weeks but I definitely don't want to wait until the last minute. Despite all the homework I have between the two classes I have now, I really don't mind. My husband finds it comical that the reading I have to do is something I'd read about in my leisure time. (Food nerd here!) Overall, this week went really well. I was surprised that some fellow classmates came up to me after these classes and asked if I was the same Joelen of "Joelen's Culinary Adventures." In fact, one classmate in particular informed me that they attended one of my 'What's Cookin, Chicago' events that was held in my home a couple years ago! Such a small world, I tell you! If there's one downside at all, it's the weight of carrying everything to class. My heavy 1181-page textbook for my culinary classes weighs a ton. Thankfully that specific textbook is one I can use for 5-6 other classes I have to take in future semesters. So in addition to that textbook, I've got a textbook for my Nutrition class, folders, paper, and my laptop/powercord/mouse. For my culinary classes, I also have to be in full uniform, bring my knife kit and my camera bag. (Chef S. allows us to bring cameras to take pictures of things we're doing and making - score!) All that combined will definitely give me a workout... not to mention having to park out in bumble and walk what seems like a mile just to get into the college with all that gear. I'd be surprised if I don't lose weight this semester! 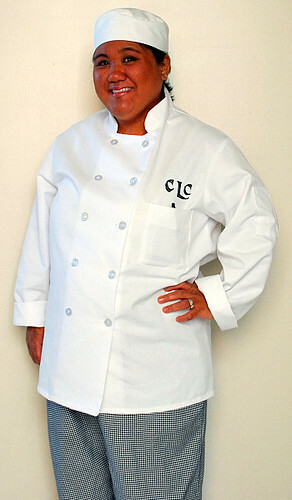 You look so cute in your chef gear! Its so great you are encouraged to take photos. It seems like quite a bit of work but it seems like after the spice and herb identifying exercise you are already heading to the top of the class. I'm just imagining you holding Joel in one arm and trying to balance a huge food book in the other to do your course reading. My fav classes were International Cuisine and Baking and Pastry. I'm wishing I could go back again now! I'm so excited for you! It sounds like this is really a dream coming true - can't wait to hear more (and live vicariously through you)! This is so great! Congratulations on pursuing your dream!! Thank you for sharing your experiences. I have been toying with the idea of going to culinary school and this will help me so much to know how things work! Thanks again for sharing! It looks so fun! That is great. I know you will do great! Joelen, I havent blogged in forever but I just noticed this one of yours and had to read it! I think its wonderful that you are going to school. You sound like you will really do well and enjoy it. Your pic is so cute too! I am starting school in 2 weeks to become an aesthetician. Im so excited about learning new things. I will be sure to catch up with your blog each week to see how you are doing. Joelen i am going to culinary school as well! It is so much fun and i wish i could blog my days at school but i just dont have the patience for that, lol. Good luck and some advice invest in shout, that pretty white coat will not stay white for very long! WOW! Congratulations and best of luck in cooking school! Looking forward to your stories and adventures. Thanks by the way for following me on Twitter. This information is very helpful for me. I personally thanks you for sharing it. Please keep on sharing such a lovely piece of information.